Carson Wentz still has a gun, and then some. If you were to attend Philadelphia Eagles training camp practices every day, one of the most obvious observations to make has been the velocity with which Carson Wentz is throwing the football. Even for the most novice of football observers, it's not hard to see that the ball gets to its target a lot faster when No. 11 throws it, as opposed to when it comes out of the hands of Nos. 9, 7, or 3. Arm strength has always been one of Wentz's strengths, and it was perhaps logical to expect that the velocity on his throws would dip a bit, simply because he is still rehabbing his torn ACL and LCL, suffered in December of last year. That has not been the case. In fact, according to data the Eagles use that tracks such things, Wentz is throwing with more velocity than he was in 2016 or 2017. "Those are things we track actually with the footballs and things that we have," said Doug Pederson when asked if Wentz's velocity has improved from last year to this year. "We can monitor that stuff. Velocity has been up, accuracy has been up. Those are the things he's been able to work on over the course of the year. "He got better last year, obviously, in games. To me it's all about eye placement, decision making, accuracy, timing. It’s all about the eyes and where you throw it and how you see it. That's one thing he's continued to get better at and work on. I do feel like now, because of the injury, he's focusing a little more on lower body strength. It's really correlated to velocity and overall speed of the throw." In other words, assuming the data is correct, it's more of a fact that Wentz is throwing with more velocity than it is the opinion of a reporter or a head coach. 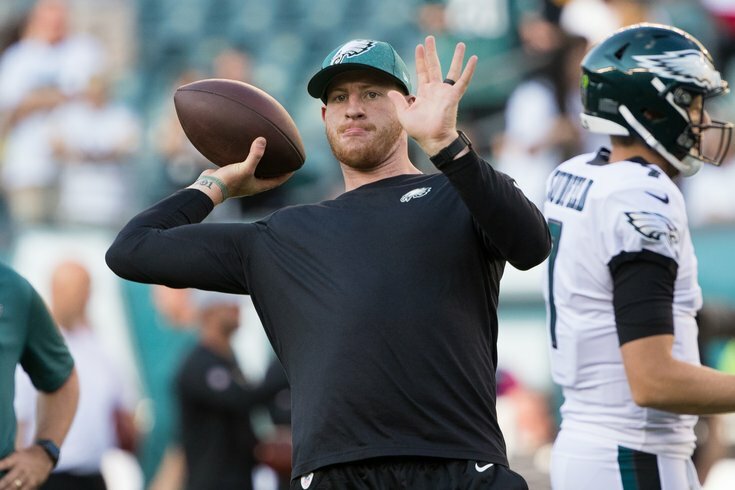 While Pederson attributed Wentz's improved velocity to increased lower body strength, quarterbacks coach Press Taylor added that it was due in part to Wentz working on his upper body. "I think his velocity has been great, Taylor said. "Obviously he has had a lot of time to work on his upper body. I think his arm endurance has been really good. He's been able to maintain those high-velocity throws throughout camp, throughout practice, which has been good to see." Taylor hadn't had the chance to check the data. "I'd have to go back and compare it to last year, but it looks impressive. That's all I can say." Wentz was a little more humble is his assessment of his velocity. "I think it's similar," he said. "I'm not out there with a radar gun or anything but I feel good mechanically. I feel very good. My arm feels strong. I feel like I can make all the throws. I don't feel like I've lost a step with that."